The holidays are a busy time of year for almost everyone, whether you live in the middle of the hustle and bustle of the city or are a suburban family decking out the home to reflect the spirit of the season. In the middle of all the activity, it’s easy to overlook your furry friends and fail to keep an adequate eye on what your pet is up to. Whether it’s the cat running out of the front door as the Christmas tree is coming in or the dog that’s determined to explore the plastic reindeer on the lawn down the street, the holidays are one of the prime seasons for lost pet issues to occur. Unfortunately, for a majority of the country, many major holidays fall during the winter months. By Halloween, temperatures are already dipping down into a range that may be unsafe for your pet. While your pet may be somewhat acclimated to the weather, especially if you live in an area that sees a lot of snow, hypothermia and exposure are severe threats that can turn fatal in a relatively short period of time. A period of bad weather may be as life threatening to an animal, especially an indoor pet, as to a small child who’s become lost and unable to find adequate shelter. Of course, there are dangers that lurk inside the home, as well as outside. 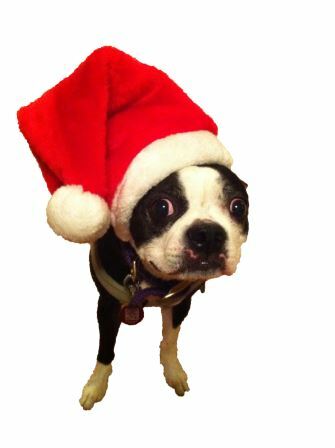 Even if your pet isn’t that inclined to roam, he may not know that eating the mistletoe or poinsettias that decorate the interior of your home will end up in a trip to the emergency room. A number of common plants that bloom during various holiday seasons can be fatal to your four-legged friends, including azaleas, ivy, oleander, and Easter lilies. One of the reasons that many people love the holiday seasons is that it’s an excuse for friends, family, and feasting to take center stage. While it’s tempting, and perfectly okay, to give your pet an extra treat here and there, overdoing it can give him more than a stomachache. Particularly in dogs that are underweight, sensitive to different types of foods, or struggle to maintain a healthy blood sugar, chocolate toxicity from scraps of dessert can present a serious danger. Too often, the family will feed unwanted food to the family dog, and if you own a Labrador Retriever, German Shepherd, or other large dog, he’s unlikely to turn down a single morsel, even if he’s already full. Unfortunately, the bad news is that these larger dogs are subject to a painful and fatal disease called “bloat”, where the stomach actually becomes twisted. This can require surgery, but in most cases, it is necessary to have the animal put to sleep to spare him further pain. Although there’s no way to prevent bloat from happening and virtually anything can cause the disease in breeds that are predisposed to the illness, food consumption is one of the leading factors. If your dog eats too much food in a short period of time, gulps it down with air and water, or simply doesn’t know his limits, this can increase the chances of bloat and other serious intestinal disorders from occurring. The larger the dog, the more voracious the appetite, and many will simply keep eating past the point where the stomach is full. Take extra precautions when feeding your pet scraps of “people food”, and make sure the holiday ham, turkey, pie, and other homemade goodies are safely out of reach of even the most determined pet. In order to keep your pet safe, no matter what dangers lurk around the corner, it’s important to make sure that he is up-to-date on his vaccinations and wears a collar and ID tags at all times. It can be tempting to cut your furry friend some slack and remove these items from time to time, but if the day you remove the collar is the same day your pet happens to dart out the front door and get lost in the snow, you may have a terribly dangerous situation on your hands. Make sure that your pet’s ID tags are made of durable material, and engraved with his name, your contact info, and any medical conditions such as asthma, diabetes, or allergies that a potential rescuer would need to know about right away. In addition, PetHub offers a unique and technologically advanced tag, which allows a rescuer to scan the unique QR code on the tag, and immediately pull up the pet’s profile page. When a pet goes missing, the owner simply needs to put up an alert on the profile page, and the owner’s contact details become visible to anyone scanning the unique tag. This allows for anyone who finds your lost pet to help bring that pet home, so they don’t necessarily have to take their pet to the veterinarian or shelter to get their microchips scanned. Nonetheless, microchipping is invaluable, because during the winter months, you actually hope that your lost furry friend ends up at a shelter, clinic, or veterinarian’s office. If there’s a microchip, the owner can be identified and contacted immediately. If this doesn’t happen, many shelters put animals up for adoption within 3 days of arrival at the facility. With all to be thankful for during the holiday season, be sure to take time out to be thankful for the furry creatures that complete your family. A little extra work in keeping them safe and sound goes a long way.